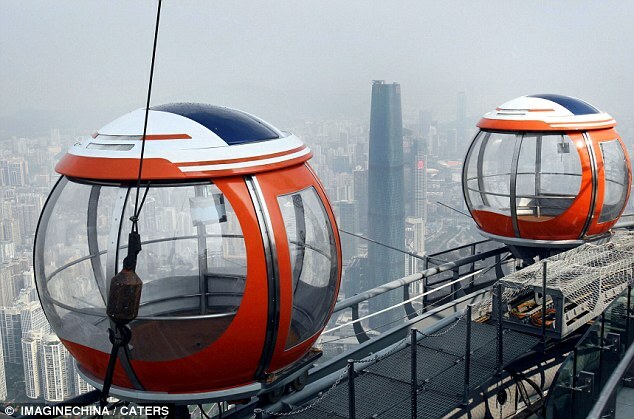 The world's 'highest' Ferris wheel' is set to open for business today on top of a 1,480ft tower in China - with passengers riding in see-through pods. Built on the 450-meter-high Canton Tower, known as the Guangzhou TV Tower, the amazing wheel consists of 16 pods holding a total of 96 fearless passengers. Unlike other Ferris wheels, it has a 15-degree incline and can resist 8-magnitude earthquakes and Beaufort scale 12 typhoons. 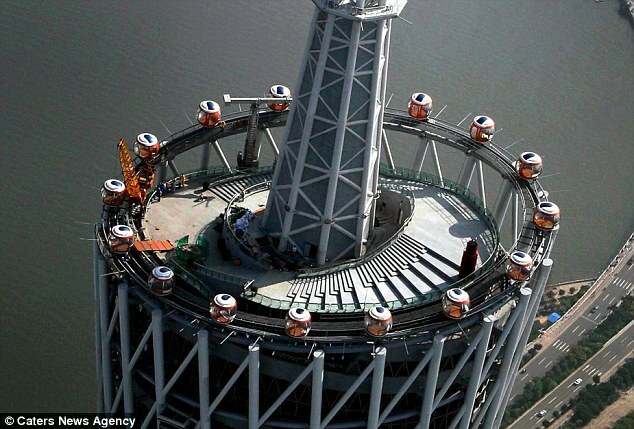 An elliptical track has been constructed around the edge of the tower's roof, and the 16 transparent 'crystal' pods take between 20 and 40 minutes to go round the track. 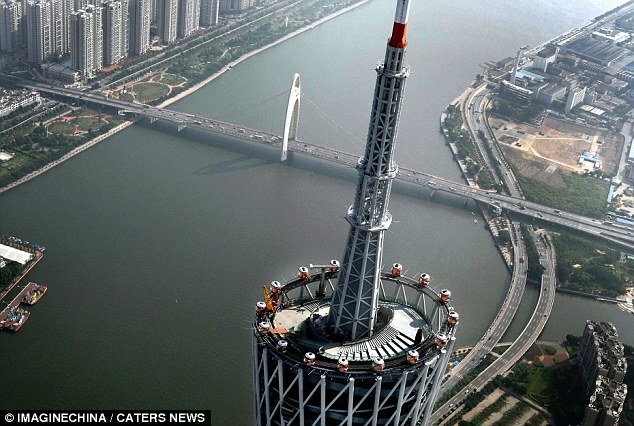 It's located in Guangzhou, capital of the southwestern Chinese province of Guangdong. 2. Formula Rossa at Ferrari World in Abu Dhabi, United Arab Emirates, is the world's fastest roller coaster with a top speed of 150mph which it can reach in 4.9 seconds. 3.Takabisha is the world's steepest rollercoaster with a drop angle of 121 degrees in Yamanashi, Japan. 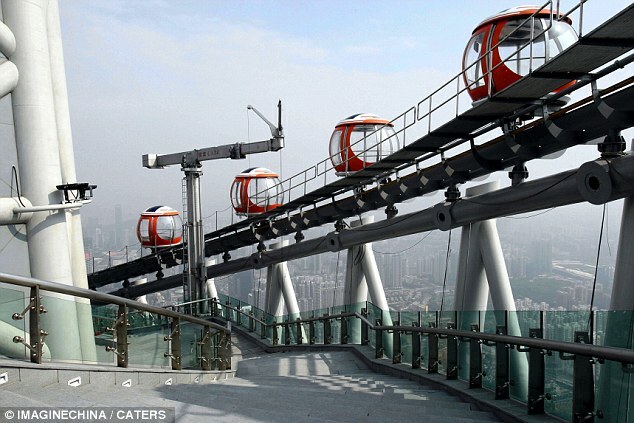 The attraction will cost visitors 130 Yuan each. Although it's described as a Ferris, its passenger cars are not suspended from the rim of a wheel in the traditional fashion and the track is horizontal. The tower is also known by its local nickname - Xiao Man's waist - which refers to a famous Geisha who used to entertain people during the reign of the tang Dynasty. She was appreciated for her slim waist and the tower has a twisted and tight appearance. In August, Las Vegas announced plans to build the world's 'tallest' Ferris wheel, which will be more than 100ft higher than the London Eye. Caesar's Entertainment, which runs the Caesar's Palace hotel and casino, revealed its wheel will be called the 'Las Vegas High Roller' and measure 550ft. 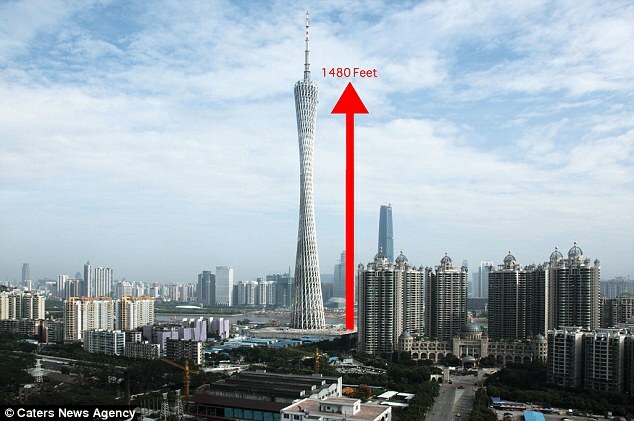 That would pip the Singapore Flyer (541ft) to the title of world's highest wheel. The London Eye is 443ft tall.